Jan 27 China Sale! Portland to Shanghai / Beijing from $379RT! 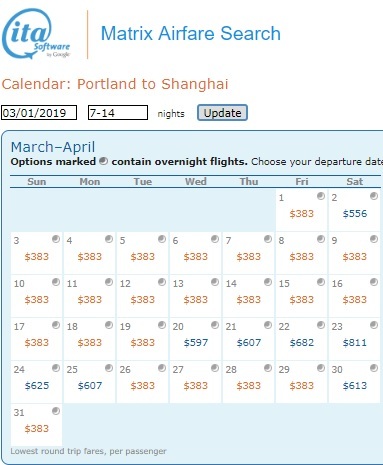 A fantastic sale from United for service from Portland, Oregon to Shanghai or Beijing China! United’s international economy fares include two pieces of checked luggage (up to 50lbs each) and a normal sized carry on. Best dates are February through April which is a really nice time in China! This flight can be used as a springboard to the rest of Asia with a short China layover as well. Citizens of the United States need a Visa in China under most circumstances. This well set you back about $150USD but is valid for one year. Shanghai and Beijing both offer a visa waiver to US Citizens for stays of 144 hours or less. Restrictions apply so please read up on this before booking. Use ITA Matrix Software to locate the cheapest dates. Book through Momondo for the frugal fares! Jan 22 Portland to Shanghai, China from $392RT! Jan 7 Seattle to Shanghai or Beijing for $368RT!